Many artists have a muse, something that is a huge source of creative inspiration for them. 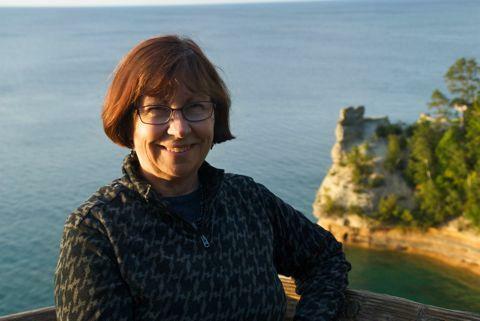 Peg Sandin is an artist based in Ironwood, MI, and her muse is Lake Superior. WXPR's Larry Lapachin has the story. Lake Superior welcomes many visitors to its shores. Some are captivated by the unpredictable vastness of water that stretches to the horizon, while others are enamored with its soaring cliffs and spectacular waterfalls. Still others find solitude in sifting through rocks along the beach, searching, often in vain, for that elusive agate. For the past 40 years, Peg Sandin, a watercolor artist, has been capturing this beauty at Little Girl’s Point in Ironwood Township on the western tip of Michigan’s Upper Peninsula. Before Sandin began capturing the beauty of Lake Superior, however, she was first taught a different art form, music. As a young child, Sandin was given piano lessons from her grandmother. Throughout high school, Sandin played the violin. In college, she studied music and music education. During this time, she didn’t take any art courses. It was after college, in 1972, while Sandin was teaching music in Sun Prairie, Wisconsin, she attended a watercolor exhibit at the Madison Art Center. Sandin was specifically captivated by the work of one watercolor artist, Lee Weiss. Sandin immersed herself in watercolor, taking courses and learning techniques from nationally renowned artists. The collection of these techniques contribute to what Sandin calls her “toolbox.” But one lesson in particular from Duluth, Minnesota watercolor artist Cheng-Khee Chee has had a lasting impact on each watercolor painting that Sandin creates. It was years later, in 1996, that Sandin made the commitment to establish more permanent roots along the shores of Lake Superior. Sandin, however, had one caveat regarding her future plans. Immersing herself in the beauty of the Lake Superior basin, Sandin’s subjects expanded from the rocks to also include the woods, wildflowers, and wildlife. More recently, however, Sandin’s interest and evolution as an artist is in the challenge of abstract art. For example, drawing heavily on her classical music background, Sandin created a series of three abstracts inspired by an aria sung by “Queen of the Night” in Mozart’s “The Magic Flute”. The setting is an outdoor Opera House in Santa Fe, NM. Watercolor paintings by Peg Sandin. A series of 3 abstracts inspired by the aria "Queen of the Night". “So I have a lot of night sky in this painting," she says. "And the Queen is singing a very, very high aria, so I have notes flying out of her mouth. It’s very abstract and very lively and very colorful”. Sandin is also aware that people who have supported her art for the past 40 years may have reservations regarding her new direction toward abstract art paintings. “At some point, I should probably have a retrospective because I’ve been painting for so long that it would be interesting, I think for people in this area that have supported me to see my evolution,” Sandin explains. “I think if they just saw abstracts, they’d wonder what happened to me”. Looking ahead, Sandin has a vision of what future watercolor paintings will capture. Over the past several years, Sandin has committed herself to taking daily walks, while observing the ever-changing Lake Superior ecosystem. It is during this time that she may come up with great ideas, or reach resolutions to difficulties in her paintings. Being an integral part of the landscape herself, Sandin shares with us the beauty of Lake Superior. Her grandmother, who taught her the essence and beauty of music, also taught her a lifelong lesson. Larry Lapachin covers all things Lake Superior for WXPR's We Live Up Here series. He's based in Rhinelander, WI, and Ironwood, MI. This story was written by Larry Lapachin and produced for radio by Mackenzie Martin. Some music for this story came from Podington Bear.